Hmm — perhaps Johnny Depp and Forest Whitaker will not be solving Biggie Smalls' murder after all. In a stunningly unexpected twist, City of Lies, the upcoming true-crime drama about the investigation into the murder of The Notorious B.I.G., has been delayed from its original release date indefinitely, according to a report by Deadline. Originally intended to be rolled out in theaters on September 7, the movie has instead been pulled from the release schedule a month out from its premiere, with no new date yet announced for the movie's debut. While it's possible that the movie is simply being delayed at the last minute to hunt out a more strategic release window, it's also quite feasible that the movie won't see release in theaters at all, instead being shifted to a more low-profile streaming release, a la Netflix's The Cloverfield Paradox. 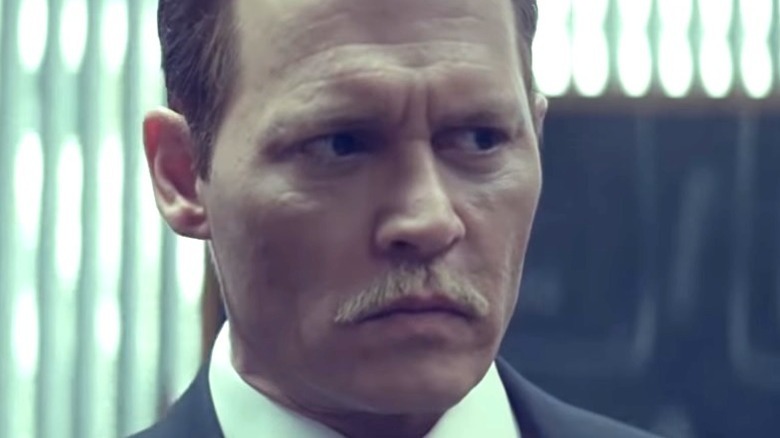 In a turn of events that may or may not be related to this false start for City of Lies, star Johnny Depp was recently sued for an alleged assault and battery incident against the film's location manager. Depp isn't the only person included in that lawsuit, which also names director Brad Furman and several of the film's producers, with damages being sought for wrongful termination, retaliation, and the cultivation of a hostile work environment. Depp has also been under fire for his involvement in the upcoming Warner Bros. Harry Potter spinoff-sequel Fantastic Beasts: The Crimes of Grindelwald. Citing alleged incidents of domestic abuse and other unsavory behavior, many on social media have criticized Depp's casting in the family-friendly movie, making it abundantly clear that a vocal portion of the moviegoing populace really wants nothing to do with Johnny Depp right now. Releasing a movie starring the actor in this sort of climate of heavy scrutiny — particularly one which doesn't… look that great — would seem to be courting a big-time bust at the box office. But it's hard to be certain if any of that has anything to do with the film's delay — in the absence of an official explanation, this is really all just coincidental. The promotional campaign for City of Lies was already in full swing with a trailer being released three months ago, which should be an indicator of how unexpected this delay likely was. It's uncommon that a movie's trailer comes out with a set release date advertised, only to then vanish into the ether, leaving the now-inaccurate trailer behind as an awkward pseudo-tease. City of Lies is directed by Brad Furman, whose previous work includes The Lincoln Lawyer with Matthew McConaughey and The Infiltrator with Bryan Cranston. Wherever City of Lies has gone to, we hope it says "Hi" to The New Mutants while it's there. Perhaps we'll see them both again some day. This city, man. This city is full of lies!